QuickTime allows playing .mov based video files, watch movies, listen music, view images as well as play dozens of multimedia content in rich feature software program from Apple. Basically, it was designed and developed especially for Macintosh (MAC OS X) users. The Microsoft Windows also demands it from Apple so that’s why they released another version for Windows. QuickTime has specific codecs that make this player eligible to play anytype of audio or video content. The developer team has added function to watch TV channels through network connection without setting up something special. The network streaming has specified engine which can determine internet connection speed so it produce maximum quality to viewers. The faster broadband users will enjoy high quality streaming so others may be receive buffering error. However, QuickTime player is fast, efficient and responsive multimedia program that offers image, audio and video content playback features. Moreover, the main screen covers: apps, music, TV shows, movies and top listed hits as well. 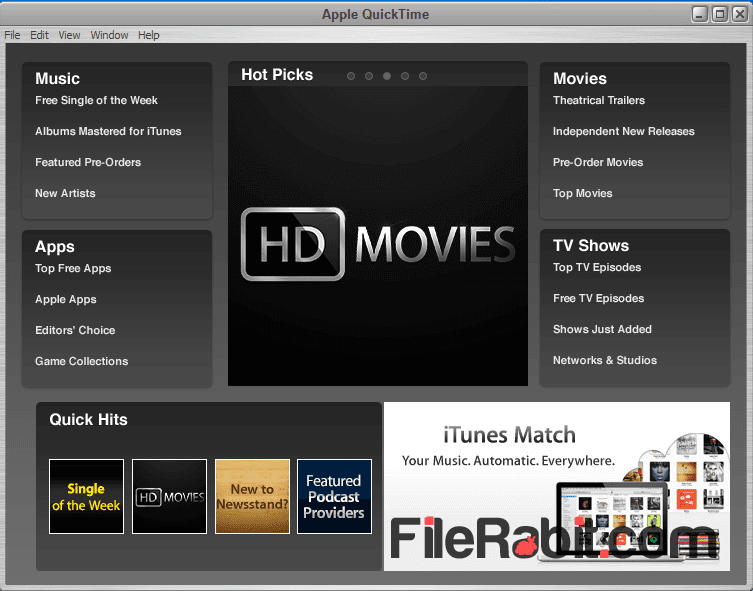 An automatic connection between iTunes and QuickTime can be found via following the main screen content. Its rich with internal codecs that are enough to play anytype of TV show or movie. However, it doesn’t include DivX and XviD codecs so Apple offers some free codecs link whenever the player finds unsupported file type. Most of videos including 720p, 1020p resolution or H.264 based codecs can be played in QuickTime player. Apple also offering QuickTime Player Pro that is tremendous and ultimate multimedia suite. The player support many keyboard shortcuts, with interface customization, video screen auto fit to screen, control over playing speed, play a list of audio or video files and enjoy smooth quality without lagging Blu-ray movies.